Since Windows 10 release, many people are finding themselves once again excited about the PC’s future. Windows 8 was a bit of a miss, but Windows 10 brings back the desktop to center-stage and is, perhaps, what Windows 8 should have been. In fact, Process Lasso looks better than ever in Windows 10, thanks to the improvements in the appearance of the native Windows application controls. As always, Process Lasso continues to be the leanest, most innovative, and most efficacious real-time optimization software on the market. So what exactly have we been up to over the last year or so, and how can it benefit you and your Windows systems? Gaming Mode 2.0 – Gaming Mode 2.0 uses a custom power profile to deliver maximum CPU performance when you’re playing a game, or doing any other CPU intensive tasks, as many of our users have been pleased to discover. ProBalance Insights – Let’s you see in a glimpse what ProBalance has acted on. With Insights, you can see the biggest CPU hogs in a nice sort-able list. SmartTrim – The first ever intelligent RAM optimizer. SmartTrim let’s users control exactly what and when actions are taken. It acts with surgical precision. ProBalance and CPUEater Improvements – We’ve continued to refine and improve our famous ProBalance real-time process priority optimization algorithm, making it more effective and safe than ever before. You can watch our new CPUEater Video Demo. Product Refinement – We’ve spent a lot of time in general product refinement, refactoring old code, improving translations, and fixing bugs and quirks. Process Lasso is better than ever, and keeps advancing at a rapid pace. If you’re an active Process Lasso user, you’ve probably seen all this evolve over the last few months… If you’re not an active Process Lasso user, then we invite you to become one. You can download and try the latest Process Lasso Pro-License version packed with all the newest features (some listed above), 100% free today. 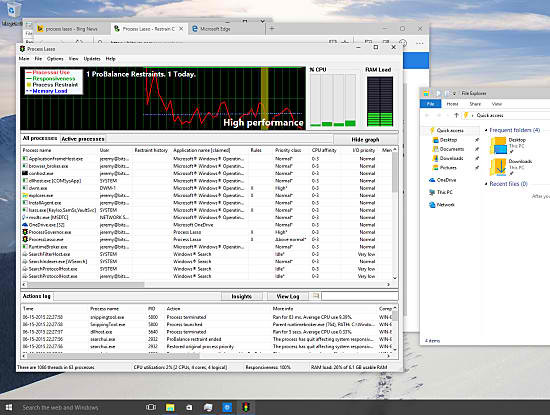 There is no better time to take control of your PC’s performance and join the rest of the world with proven real-time optimization technology authored by one of the companies largely responsible for creating this emerging industry.